Five people died and several seriously injured in a fatal car accident yesterday, January 1, in Tarka Local Government Area of Benue state. 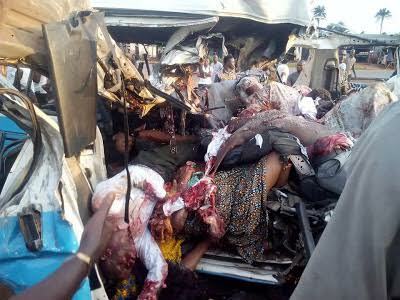 According to source, the accident involved a lorry conveying more than 50 members of the Universal Reformed Christian Church, URCC (NKST) who were on their way to the annual NKST Conference in Gboko local government area. The vehicle was said to have skidded off the road. The graphic pic after the cut..
"I think the driver of the lorry was trying to avoid a pothole on the road when he lost control of the lorry and ended up in the bush where the vehicle fell with the passengers," an eyewitness said. "As I speak with you, we gathered that five person died in the accident while many sustained injuries, though they have all been taken to public hospitals in Tarka and Gboko for treatment." he added.